Once again, Tazza D’Oro will be celebrating the Tour de France which begins on July 7th. We are so excited. As a preview celebration of cycling please join us on July 3rd for the art opening at of “Art by Cyclists” hosted and sponsored by Urban Velo. The event will include some amazing food and beverage beginning at 6 pm. Jeff is always hanging out at Tazza D’Oro doing our graphics work so ask him about any details. Jeff- bike hat, cycling shoes, good-looking and apple computer. Can’t miss him. Then on July 4th, Emily Jackson, a great Tazza D’Oro Barista will be hosting the Creamcycle. An Ice Cream themed scavenger hunt with prizes. Registration at 2pm at Friendship Park between Matilida and Millvale Streets in Friendship. There is a 5 dollar registration fee. This should be really fun. Don’t let the “race” thing scare you away. It’s all about having fun and riding the streets of Pittsburgh. 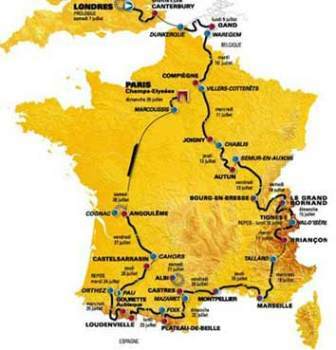 Stay tuned for many other July events celebrating the Tour de France – coffee/espresso tastings, wine tastings and foods from regions of France.